The Tropical Resort and Marina in DeLand, Florida might not be the first place you’d think of when looking for hotels near the Daytona Speedway, but think again; we can offer more than most Daytona 500 hotels. If you’re feeling the winter blues, tinged with a need for speed, come and visit Florida at the best time of year. While most of the USA shivers, February in Florida is filled with sunshine. With daytime temperatures in the 70’s, it’s the ideal time and place for a break. Because of our central position, you can bring the whole family knowing they’ll all find something enjoyable to do. Stay with us for the Daytona 500 and Speed Week! Whether you choose to come just for the Daytona 500, or to enjoy the entire speed week event, you’ll find DeLand, with its old world atmosphere, is an excellent place to stay while enjoying the run up to the ‘great American race’ traditionally held on the last Sunday in February. Race week is filled with events, from practice sessions to pickup truck races and the Gatorade Duel races which help determine the grid positions for the big race itself. But what if other members of the family don’t share your passion for racing? Daytona itself is a short drive away, so speed week is easy. While a trip to the East will get you to the Canaveral National Seashore and the world famous Space Center. Tire the kids out with a visit to one (or more) of Florida’s theme parks, also within easy travelling distance. And if you love to fish, what can we say? This is simply the perfect spot. February is packed with events, from the regular Mardi Gras celebration on Saturdays at the Universal theme park, to the Silver Spurs Rodeo, the largest rodeo East of the Mississippi, held yearly in Kissimmee. If you, or some of your party, just want to relax, you can do that too! Just kick back, sit in the sun, and enjoy. So, why choose one of the crowded Daytona hotels for your race week vacation? Come to us! 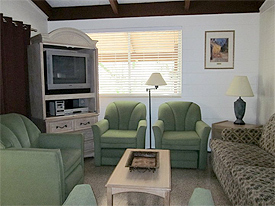 We have an RV campground, hotel rooms and multi-room apartments with 1, 2 or 3 bedrooms, plus a full kitchen. You’re bound to find accommodations to suit your family and your budget. So when you’re looking for a hotel near Daytona Speedway, think of us, and make it a vacation the whole family can enjoy.